1. In a large saute pan over medium high add clam juice and water and heat until boiling. Add clams and cover with lid. 2. Steam clams until shells are open. Discard any that do not open. Save any remaining liquid. Remove clams from shells and chop. 3. Place clam meat in medium bowl. Add garlic, preserved lemon butter, romano cheese, chili, chives, dill, parsley, panko. 4. Stir until well combined and mixture holds together. It should be dry and chunky. Pack the mixture into empty clam shells, place on small sheet pan and bake 15 minutes or until bubbly. 5. Cook linguine according to package instructions. Drain. Set aside. In a large saute pan over medium heat add butter, garlic and shallot. Saute 2 minutes. Add cooked linguine, basil, parsley, chives, chili flake, clam juice and touch of cream. Stir well to combine. 6. To serve place pasta on center of plate. 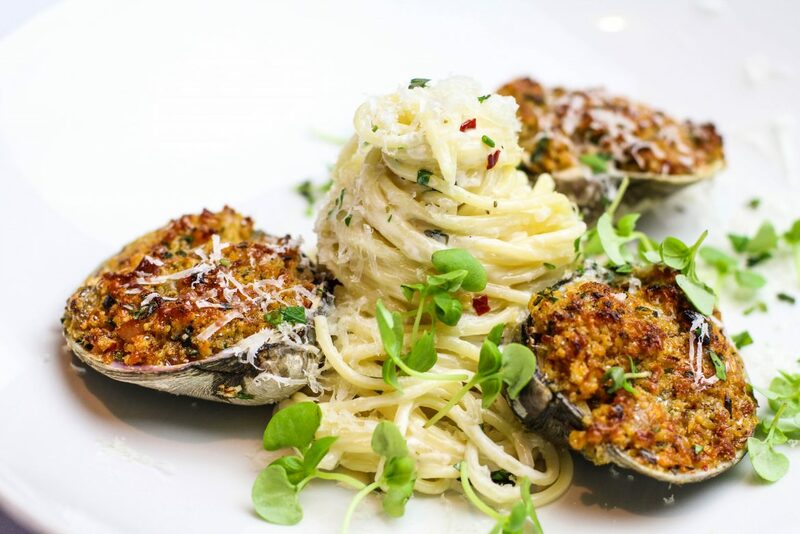 Place 3 bubbly baked clams along side of pasta and top with a generous amount of romano cheese.